There are so many brides-to-be who dream to be dressed in a designer wedding dress for their wedding party. The bride can get a beautiful custom made wedding dress made by any popular designer. This is to make sure that the wedding dress is made as per to the brides dress style and also her preferences for wedding dress. 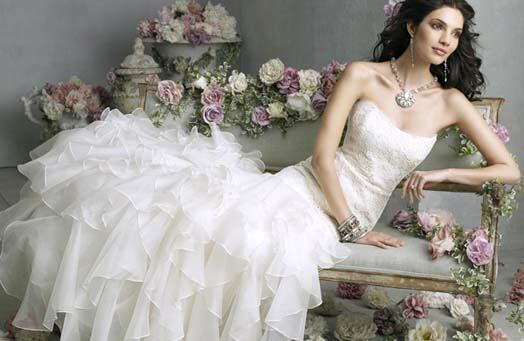 There are so many fashion outlets from which brides can choose their designer wedding dress for their wedding. The style and look of the designer bridal attire will be in the same way like the mass of attire produced, but each having unique wedding outfits. There are many plus points of a custom wedding grown. The wedding dress must be in accordance with the fitting and flattering the figure shape of the bride. The neck lining of the wedding dress such as v-neck or sweetheart neckline, halter or strapless and many more, should be well designed and made so as to make a perfect designer dress that will look fantabulous on the bride. Choosing a designer dress with princess A-line, the bride clearly knows that such dress normally fits perfectly as it flares in a downward direction leaving the trail of an elegant yet princess like shape style. There is the designer dress known as the mermaid dress that the bride can opt for if she wishes to look slimmer on the day of her wedding. The bride should make very sure that any of the designer wedding dress that she decides for to wear should flatter her bust area as well. The brides should know about what sleeve style she will like to have on her wedding grown. She can opt for cap sleeves wedding gown or even sleeveless. Another quality of designer wedding dress is the kind of fabric material that will be used in the making of the bride’s wedding outfit. The bride should be well aware of the season of her wedding so as to decide what texture of the wedding gown fabric she would like to have on herself. It is advisable to opt for a bridal dress that has heavy texture during the cold weather season wedding and a light fabric dress for when it is a warm season wedding. Whatever be the case, the bride should be sure that her designer wedding dress and related accessories, as well as the other dresses, are in a similar style and related color that will suit the wedding occasion.